John Pearson was a trade union rep and branch secretary for PCS at Hewlett Packard until he was sacked on trumped up charges. During a dispute over job cuts, John received a spreadsheet from the employer detailing the job pools from which 584 job cuts were to take place as part of the statutory consultation. On instruction from his branch executive committee, he shared this information with members. HP responded by suspending John on a charge of breaching confidentiality. An additional charge of breaching HP policy was added on the grounds that John had given press interviews about the ongoing dispute in his trade union capacity. Clearly motivated by union busting and the desire to target a high profile trade union rep, the bosses used these trumped up charges to dismiss John. John's dismissal for carrying out his trade union duties was automatically unfair under section 152 of the Trade Union and Labour Relations (Consolidation) Act 1992. An employment tribunal confirmed this and, crucially, HP didn't appeal the verdict. 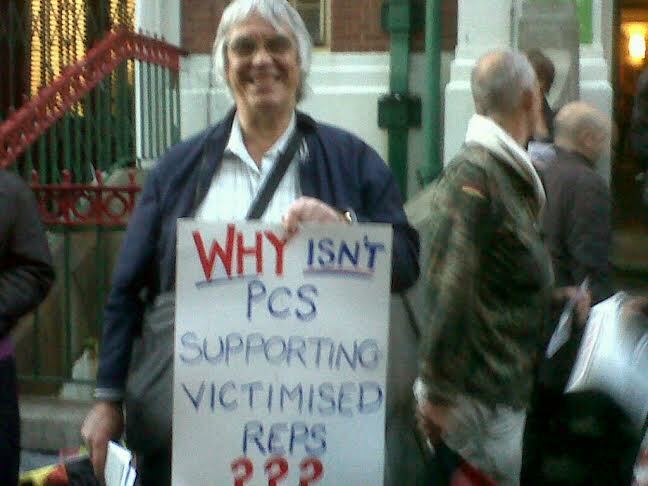 Unfortunately, John took his case to employment tribunal and won it without the support of PCS. The union abandoned John even as his branch was in the middle of a consultative ballot over industrial action in support of him. General Secretary Mark Serwotka confirmed in writing that they would not be seeking a remedy for him, either industrially or legally, and as such under the rules his union membership was terminated. Rank-and-file PCS members stood by John, setting up a defence campaign and taking a motion asking for official support to last year's Conference. The motion fell after a member of John's branch spoke to slander him, contradicting the sworn evidence he later gave at John's tribunal and the National Executive Committee supported the slander. Members of PCS as well as supporters from outside the union signed an open letter demanding support for John after his tribunal win. Mark Serwotka responded by entrenching his position, offering several layers of excuses which John has debunked with the pertinent facts here. Another rep in an almost identical case to John's, Sofia Azam, joined John to lobby PCS for support in their respective cases. Sofia had been supported at employment tribunal, but the union had argued the case on entirely the wrong grounds, losing the case and then refusing to support her employment appeal tribunal. Senior PCS reps met with them both in response, but still resolutely refused to change their position. This year, another motion is going to PCS conference on the subject. Unlike last time, it comes on the back of a very public campaign highlighting the union's failings when it comes to support for victimised reps. The NEC has tried to tackle this by issuing a bulletin to all branches justifying its actions on the basis of misinformation and half-truths. Worse, it showed up its own hypocrisy by urging support for another victimised rep in the very same briefing where they are doing their utmost to discredit John. This propaganda has been countered in depth here, but obviously the NEC has a monopoly on communication to PCS members that nobody outside of the leadership can hope to match. PCS Left Unity, the political faction which runs the union, is also urging its members and supporters to oppose the motion in support of John. The scene is set, then, for a fractious debate of which the outcome remains uncertain. On the one side, the principle that a union is a collective and should stand resolutely with its members and reps when they are attacked by the bosses. On the other, a dismissal of basic principles as impractical and a justification of a militant worker being sacked that would do the bosses proud. There are other debates taking place in PCS. Conference will begin with the vote on whether the leadership was right to unilaterally re-elect itself by scrapping this year's elections. Discussion of the response to the new Tory majority government will no doubt also take centre stage. But democracy is irrelevant if the union doesn't stand for all its members. A fight against the Tories will lose considerable fire if reps cannot guarantee that they will be supported if they face victimisation. This debate, and having to fight tooth and nail for the very concept of solidarity - against professed 'socialists' no less, is the most important one taking place at conference. If Mark Serwotka and the NEC are able to walk away from that feeling even the slightest bit justified in their treatment of John, something vital will have been lost. There will be a lobby in support of John ahead of Conference which everyone in or able to get to Brighton, whether part of PCS or not, is welcome to attend. You can sign the open letter in support of John here.